Left: Accattone, 1978. Oil, wax, modeling paste on canvas, 84 x 72 inches. Right: Jack the Bellboy / A Season in Hell, 1975. Joint compound, Rhoplex, oil, plaster, wire mesh on canvas, 72 x 48 inches. Photo: Andy Romer. 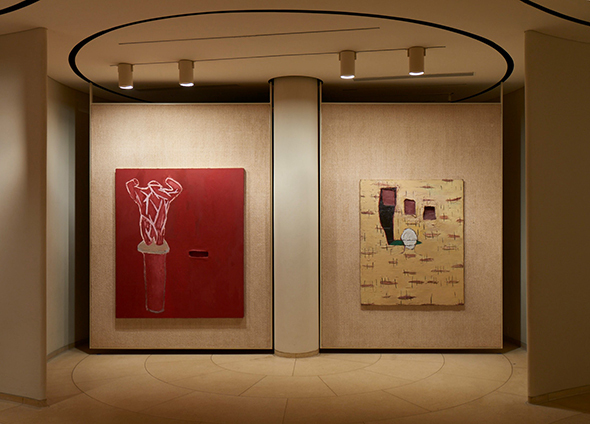 Glass House proudly presents Julian Schnabel: “Paintings that I hope Philip and David would like,” an intimate survey showcasing Julian Schnabel’s prolific painting career. Over the course of the exhibition period, the Painting Gallery panels will rotate three times to present paintings selected by the artist. Each rotation will feature six works from different periods of the artist’s career. Wax Paintings from the 1970s will be on view from May 1 to June 5. Gathered from private collections, this rotation offers a glimpse into Schnabel’s early investigations into painting. The six works on display at the Glass House were all created before his first solo exhibition in New York City at Mary Boone Gallery in 1979. These works reveal themes that permeate throughout the artist’s oeuvre. Upon close examination, the pearlescent layers of wax and modeling paste reveal the hand of the artist, who was building up the surface to accept his own version of a new painted language. Schnabel also notched into the surface of his paintings and built out of the surface to further illustrate the notion of time passing as it does. The titles of several of these early works—Accattone, Procession (for Jean Vigo), Shoeshine (for Vittorio de Sica) indicate a strong interest in European cinema, hinting at the artist’s future development as a filmmaker. The second rotation, Paintings after 2000, on view from June 8 to July 10, feature works from the artist’s collection from different series: Nothing Paintings, Weather Paintings and Landscape Paintings. The Nothing Paintings were made on images printed on polyester. The Landscape Paintings were made on found materials bought in Mexico. Reminiscent of aerial photography, the Weather Paintings are mysterious images photographically printed as an aerial view of the land, creating a disorienting sense of sight so that the viewer feels suspended above rather than being on the ground. The third and last rotation, Paintings from the 1980s and 1990s, feature works from the Glass House’s Permanent Collection. Collected by both Philip Johnson and David Whitney, these works are on view from July 13 to August 14. Upon entering the Painting Gallery, visitors first encounter Schnabel’s selection of five map drawings from 2006, Soundings in Fathoms and Feet. A general appeal and tendency towards the aleatory, the discarded, and the unlikely have informed much of Schnabel’s choices in executing his paintings. The objet trouvé is as much a part of his paintings as paint itself. Whether he makes paintings out of found objects or preexisting materials or he makes paintings that give the feeling that they may have come from an object that he might have come across indicates the passing of time. When asked about one of his paintings made on a Kabuki backdrop and why he would paint on materials used in traditional Japanese theatre, Schnabel’s response was, “If you go somewhere and don’t bring anything back with you, what’s the point of going?” This attitude continues through his Landscape Paintings, on view here. Julian Schnabel: ”Paintings that I hope Philip and David would like” is organized by Irene Shum, Curator and Collections Manager. Shum states, “After Frank Stella, Julian Schnabel is the most represented artist in the collection, so it was important for the Glass House to present Julian’s work more fully. Putting the works in the Glass House Collection within the context of his career allows the public to develop a deeper appreciation of both the artist and the collection. The artist’s creative process is revealed.” Paintings were installed by the Artist. Julian Schnabel (b. 1951, Brooklyn, New York) is known for his multidisciplinary practice that extends beyond painting to include sculpture and film. His use of preexisting materials not traditionally used in art making, varied painting surfaces and modes of construction were pivotal in the reemergence of painting in the United States. Resisting the turn to traditional conventions of painting and sculpture that characterized the 1980s, he began his series of “Plate Paintings,” imagic works with sculptural surfaces produced by layering shards of found pottery with thick applications of pigment. Throughout his career, he has sustained his use of found materials and chance-based processes, transforming the conventions of painting and opening the door for a new generation of young artists. Since his first solo exhibition in 1979, Schnabel has been the subject of numerous solo exhibitions, including retrospectives organized by the Tate Gallery, London (1982); Kunsthalle Düsseldorf, Düsseldorf (1987); Centre Georges Pompidou, Paris (1987); Whitney Museum of American Art, New York (1987); Musée d’Art Contemporain, Nîmes (1989); Palais des Beaux-Arts, Brussels (1989); Museum of Contemporary Art, Chicago (1989); Fundació Joan Miró, Barcelona (1995); Schirn Kunsthalle, Frankfurt (2004); Museo Nacional Centro de Arte Reina Sofía, Madrid (2004); Museo di Capodimonte, Naples (2009); The Art Gallery of Ontario, Toronto (2010); Museo Correr, Venice (2011); J.F. Willumsens Museum, Frederikssund (2013); Dairy Art Centre, London (2014); Museu de Arte de São Paulo, São Paulo (2014); and Aspen Art Museum, Aspen (2016). Julian Schnabel currently lives and works in New York City and Montauk, Long Island. The Glass House was built between 1949 and 1995 by architect Philip Johnson. The Glass House is a National Trust Historic Site located in New Canaan, CT. The pastoral 49-acre landscape comprises fourteen structures, including the Glass House (1949), and features a permanent collection of 20th century painting and sculpture, along with temporary exhibitions. The tour season runs from May through November and advance reservations are required. For more information, and to purchase tickets, visit www.theglasshouse.org. The National Trust for Historic Preservation is a privately funded nonprofit organization that works to save America’s historic places to enrich our future.